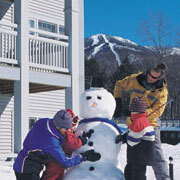 Did you know that Smugglers Notch is ranked #1 for Family Programs in North America for 8 years running? Smugglers Family Ski Resort has ski/ snowboarding programs, lessons and activities for kids from 2½ years to 17 years old. Smuggler’s million-dollar childcare center is the home for Fireflies (kids 6 weeks to 16 months), Little Dippers (17 months to 2½ years) and Little Rascals (2½ - 3 years). Everybody is special at Smugglers. Even mom and dad can get away for a romantic evening knowing that there is a certified child care provider watching the children. There is a teen center for kids aged 13 –15 years old, and an outer limit teen center for those 16 and older. Other activities, for all ages, include mountain exploration, swimming, basketball, and organized teen activities. We field tested Smuggler's for 2 years running and we can attest to its suitability for family travel vacations. The proximity of amenities to the hill, the beautiful region, the great skiing, the attention to detail when it comes to the kids ... all in all it was a great place to learn to ski with the kids. Highly recommended for skiers, young and old.